After a theatrical end to the Champions League groups, the four English teams – Chelsea, Arsenal, Manchester United and Manchester City – now know the sides they could face in the knockout stages and can start preparing for the challenge ahead. The basics of the draw state that no side can meet a team from their own group or their own country, with the top seeded team (the group winners) playing the second-leg of their last 16 tie at home. That means none of the Premier League sides can play each other, but it leaves the Gunners and Manchester City open to be drawn against the two Spanish giants – Real Madrid and Barcelona or the reigning champions Bayern Munich. Thanks to Chelsea securing their place at the top of Group E thanks to a narrow 1-0 win over Steaua Bucharest, the team will be favourite along with Manchester United against any team in the knock-out stages. For Chelsea, the toughest draw on paper appears to be a possible meeting with AC Milan. Chelsea will avoid other group winners and will enter into the same group as one of the weaker teams left in the tournament and are well positioned for the rest of the tournament. As soon as the draw takes place, bets are likely to start rolling in on who will raise the trophy at the Jeventus Stadium in Turin, Italy on 14 May 2014. Until then, pundits will be testing their skills on Jack Gold no.1 mobile casino. For those wanting to prepare themselves, here’s who the four English teams could face in the first knockout round. All will be revealed on Monday when the draw takes place in Nyon. 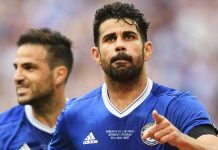 Chelsea: Bayer Leverkusen, Galatasaray, Olympiakos, Zenit St Petersburg, AC Milan. Arsenal: Real Madrid, Paris St-Germain, Bayern Munich, Atletico Madrid, Barcelona. Manchester City: Real Madrid, Paris St-Germain, Borussia Dortmund, Atletico Madrid, Barcelona. Manchester United: Galatasaray, Olympiakos, Schalke, Zenit St Petersburg, AC Milan.